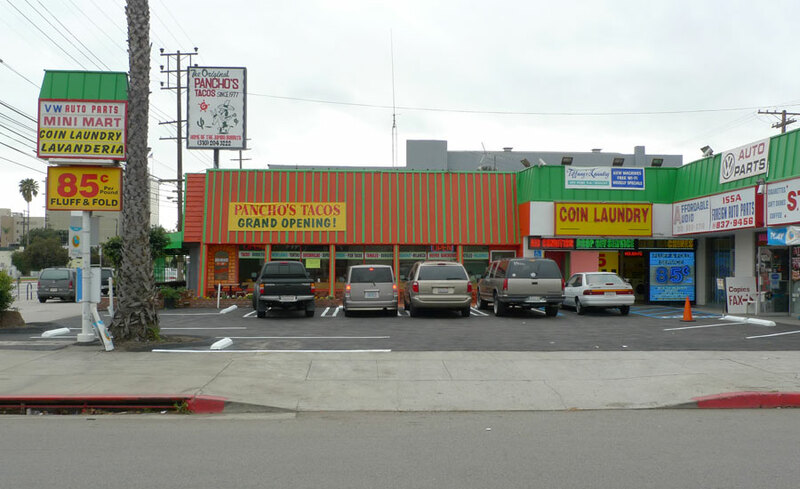 Pancho’s Tacos took over the vaguely Googie space that was formerly Campos’ Tacos on Venice Boulevard in Palms near downtown Culver City. Campos’ was a great place to get a couple extra large, extra sweet al pastor tacos and a Negra Modelo for a cheap and satisfying meal. I took the occasion to see if its successor was any good. As you can see from their sign, Panchos’ boasts of having roots that go back to 1977 – they have another location on Lincoln in Santa Monica. I stepped inside and noticed some changes. Campos’ had a weird vibe, due to there being what looked like somebody’s private den with sports-blaring televisions and easy chairs in one corner of the dining room. Pancho’s walled off that corner, and instead sports a new mural featuring Mexican revolutionists. Next I looked up at the menu, and saw that the default taco consists of meat, cheese, lettuce, and tomato, in either soft or crunchy format. Now I’m no bigot opposed to the very institution of crunchy tacos, or tacos containing cheese. I’ll eat half a dozen crunchy tacos at Del Taco any time you put them in front of me. I look forward to documenting a visit to delicious Tito’s Tacos this year, primarily as a rebuttal to all those assheads who rail against Tito’s on Yelp. But the crunchy and cheesy tacos aren’t what this project is about – it’s about the platonic, refined taco of tortilla, meat, salsa, onions and cilantro. So that’s what I ordered – Pancho’s sells them for $1.45 each, and they are called “street cart tacos” or somesuch, and I had the al pastor, carnitas, and carne asada. They were about average in size for tacos. The carnitas got eaten first, and it was pretty good. It had good color, more brown than grey, and was juicy and flavorful, but lacking the satisfying texture of really good carnitas. Next the carne asada – pure and simple, this was the best of the lot, with salt, pepper and citrus fruit flavors complimenting tasty beefiness. The tortillas were the typical bilaminated sort – nothing special. Lastly, and waiting might have been the biggest mistake I made all day, the al pastor – the meat was sludgy in a thick sauce with lots of grilled onions, and a rich, sweet flavor reminiscent of mole sauce. It tasted like chocolate! The tortillas became saturated with the sauciness and I experienced catastrophic taco failure halfway through eating. I had to finish my taco with a fork. 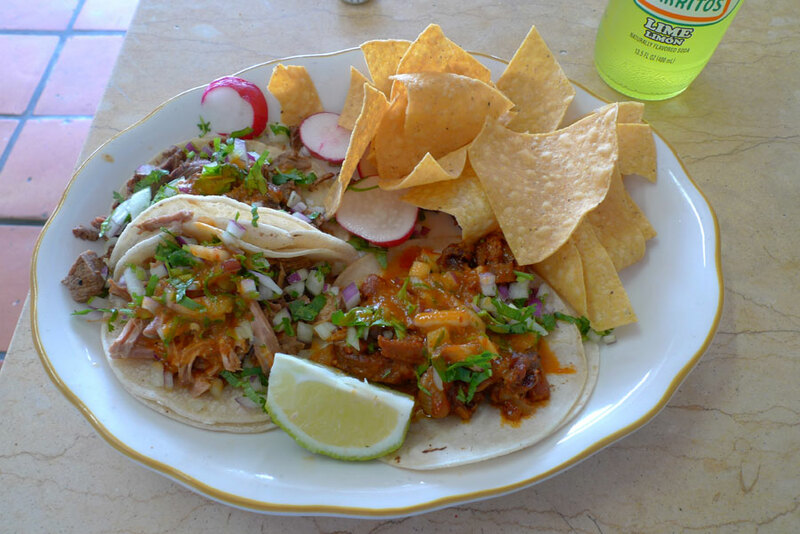 The flavor of this al pastor was unique and still enjoyable, but weird – not a new favorite. If I go back to Pancho’s, I think I’ll try the crunchy cheesy tacos. There is the theory that if a restaurant has a food item in its name, then that’s what you should order, and Pancho’s is surely named after its crunchy beef taco. It should be noted that their menu features burritos most prominently – is this a burrito joint masquerading as a taco shop? The distinction between burrito shop and taco shop is an important one with seldom a fine line between. I am the Count von Roadkill. Come, play the Count the Road Debris Game with me today. ONE torn tire!